Black-eyed susans are part of the sunflower and aster family of flowers. These simple and bright daisy-like flowers are native to the entire U.S. and parts of Canada. Some black-eyed susan varieties are perennial flowers that die back in the autumn and grow again in the spring. Other black-eyed susan varieties are annual flowers that self-sow at the end of the summer with new plants growing the next spring. Leave the stalks of both annual and perennial black-eyed susans standing throughout the winter. There are several reasons for leaving the stalks standing instead of cutting them down. Standing black-eyed susans (both perennial and annual) provide seeds for birds to eat over the winter months. In addition, annual black-eyed susans self-sow when they are left standing. If you cut them back in the autumn, they will not be able to drop their seeds to grow more plants in the spring. Cut back the stalks of perennial black-eyed susans in the late autumn after the plant has wilted to the ground if you prefer a cleaner flowerbed over the winter. Cut the stalks so that 4 inches of stalks extend out from the bottom-most basal leaves of the plants. 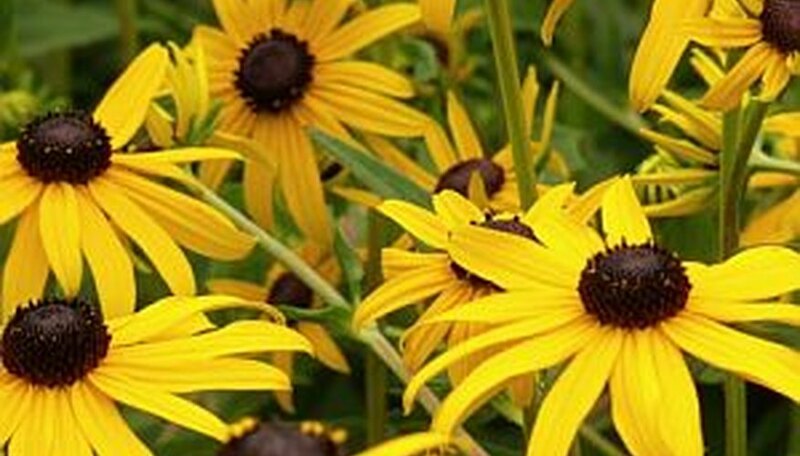 Lay down a 2-inch layer of shredded mulch over the roots of the perennial black-eyed susans. Do not mulch around the growing area of annual black-eyed susans because the seeds will not be able to sow themselves into the soil if the soil has mulch over it. Collect the seeds of annual black-eyed susans if you choose to cut them back. Lay the stalks out with the seed heads resting on a paper plate. Allow the seed heads to dry on the plate. When the seeds have dried sufficiently, you will be able to shake or rub them gently over the plate and they will fall easily. Place the dried seeds into a paper envelope, label them, and save them for spring planting. Clear mulch away in the spring, if you placed it around the perennial black-eyed susans.